"Entre les murs" redirects here. For the novel, see Entre les murs (novel). The Class is a 2008 French drama film directed by Laurent Cantet. 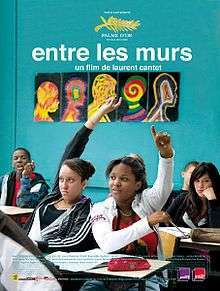 Its original French title is Entre les murs, which translates literally to "Between the walls" or "Within the walls". It is based on the 2006 novel of the same name by François Bégaudeau. The novel is a semi-autobiographical account of Bégaudeau's experiences as a French language and literature teacher in a middle school in the 20th arrondissement of Paris, particularly illuminating his struggles with "problem children": Esmerelda (Esmeralda Ouertani), Khoumba (Rachel Regulier), and Souleymane (Franck Keïta). The film stars Bégaudeau himself in the role of the teacher. The film received the Palme d'Or at the 2008 Cannes Film Festival, making it the first French film to do so since 1987, when Maurice Pialat won the award for Under the Sun of Satan. The Class was also nominated for an Academy Award for Best Foreign Language Film but lost to Departures. The film centers around Marin and the various experiences he has with students in his French literature class within one academic year. The class is difficult, as Marin is unable to relate to his students due to his ethnicity and class status . Marin makes various attempts to try and garner trust and respect from his students but fails miserably . At the students' protest of their dislike of the required reading material Anne Frank, due to lack of cultural relevance, Marin tries to gain insight into the lives of his pupils. He asks his students to write self-portraits in which they describe their aspirations, hobbies, and dislikes. The self-portraits are eventually collated by Marin who creates an end-of-year book with them. Most of his students respond positively to this assignment including Soulemayne, a student from Mali whom Marin allows to complete a photographic autobiography . However, all of this new found trust and respect that Marin gets from his students quickly dissipates after a faculty meeting in which two of his students are allowed to attend as class representatives . Marin would go on to make disparaging comments about one of his students in this meeting and even more disparaging remarks about the class representatives who would serve to be whistleblowers later on in the film .The film concludes with consequences of Marin's actions and failures that ultimately leave him unscathed and one of his students expelled . The film explores themes of colonialism, displacement, assimilation versus cultural pluralism and white privilege . Vincent Robert as Hervé, the sports teacher. The film has received critical acclaim, achieving a 96% rating at Rotten Tomatoes out of 150 reviews counted. The site's consensus reads, "Energetic and bright, this hybrid of documentary style and dramatic plotting looks at the present and future of France through the interactions of a teacher and his students in an inner city high school." Metacritic lists Entre les murs with a rating of 92, making it one of the best reviewed films of the year according to the website. The film was warmly reviewed by the critic Philip French who noted: "There is a remarkable French tradition of school films, extending from Jean Vigo's Zéro de Conduite, to Nicolas Philibert's Être et avoir. Laurent Cantet, whose parents were both teachers, carries it on and he elicits marvellous performances...As the teacher at a tough, racially mixed, inner-city school in Paris, Marin (François Bégaudeau), neither weary cynic nor wide-eyed idealist, is a decent, determined realist..not a saint, though by the end of the school year he has exhibited certain of the necessary qualities." The film was the featured 'opening night' selection at the 46th New York Film Festival in 2008. The film appeared on many critics' top ten lists of the best films of 2008. 1 2 "Entre les murs". JP's Box-Office. ↑ "The Class". Metacritic. Retrieved 13 August 2013. 1 2 3 4 5 6 7 8 9 10 11 12 13 14 "Metacritic: 2008 Film Critic Top Ten Lists". Metacritic. Retrieved January 11, 2009.